Court-Related Email Scams. The Florida Supreme Court warns the public about email scams masquerading as official Supreme Court orders. Read more . Interim State Courts Administrator. The Florida Supreme Court announces new Interim State Courts Administrator. Read more . Applications accepted for Bar Examiners. Applications are being accepted for positions on the Board that screens applicants who want to become members of the Bar. Read more . New Florida Supreme Court Website. Florida Supreme Court launches first smartphone-friendly website today. Read more. New Officers Selected for Board of Bar Examiners. A new chair and vice-chair have been selected for the Florida Board of Bar Examiners from the Miami and Jacksonville areas. Read more . Canady Becomes Chief Justice. In a quiet transition, Charles T. Canady moves back into the role of Florida's Chief Justice that he last held in 2010 to 2012. Read more . Judicial Candidate Training Forums set for May. Florida's regular judicial campaign conduct forums to help train judge candidates in their ethics requirements are set for 10 cities around Florida in May. Read more. Supreme Court to Start Facebook Live Broadcasts. On Thursday, January 25, 2018, the Florida Supreme Court will become one of the first courts in the world to broadcast all of its proceedings in real time on Facebook Live. Read more . Supreme Court Launches Podcast Program. "Beyond the Bench" is a new podcast series that covers the work carried out by some of the departments at the Supreme Court including the Clerk's office, Library and Public Information Office. Read more. New Officers Selected for Board of Bar Examiners. A new chair and vice-chair have been selected for the Florida Board of Bar Examiners from the Panama City and Miami areas. Read more. Chief Justice Labarga to Speak at Harvard Hurricane Conference. Florida Chief Justice Jorge Labarga will speak Monday, October 16, 2017, at a Harvard conference on challenges this year's hurricanes posed to the legal system. Read more . Courts Closed Statewide for Irma. Florida's Chief Justice Jorge Labarga has ordered the Florida state courts closed statewide Friday for Hurricane Irma. Read. more . Supreme Court Names Dade City man to Bar Examiners. The Florida Supreme Court has named a Dade City man to the Florida Board of Bar Examiners. Read more . Supreme Court Names Three to Bar Examiners. The Florida Supreme Court has named three people from the Panama City and Tampa-St. Petersburg areas to the Florida Board of Bar Examiners. Read more . Supreme Court Warns of Court-Related Scams. The Florida Supreme Court is warning people not to fall for scams that try to trick people by falsely saying they must come before a state judge or pay money to a state court. Read more . Supreme Court Marshal's Office Wins Law Enforcement Accreditation. The Florida Supreme Court Marshal's Office has become the first and only Florida agency housed entirely inside a court to become an accredited law enforcement agency. Read more. Justice Parker Lee McDonald, 1924-2017. Former Florida Chief Justice Parker Lee McDonald will be remembered for his steadfast hand after passing today at his home in Tallahassee. Read more . Florida State Courts Lead the Nation in Social Media Use. Read a press release about the first-year implementation of Florida's court communications plan and the court's systematic use of social media to inform the public. Read more . Lawson Formally Joins the Court. Florida's 86th Justice, Alan Lawson, will formally join the state's highest court amid unprecedented pageantry on April 5, 2017. Read more . Chief Justice Labarga Names Members of Constitution Revision Commission. Florida Chief Justice Jorge Labarga has appointed Arthenia Joyner, Roberto Martinez, and Hank Coxe to the 2017 Constitution Revision Commission. Read more . Statement on Premature Order in Perry v. State. The Public Information Office released a press statement on the premature release of an order in Perry v. State. Read more . Chief Justice Creates Guardianship Workgroup. Chief Justice Jorge Labarga has created a workgroup to study the way guardianship works in the state courts system. Read more . Access to Civil Justice Commission Becomes Permanent. Chief Justice Jorge Labarga has issued an administrative order making the Florida Access to Civil Justice Commission permanent. Read more . Chief Justice to Accept Resumes for CRC. Chief Justice Jorge Labarga will accept resumes for consideration for his three appointments to the 2017 Constitution Revision Commission. Read more . Justice Perry Announces his Retirement. James E.C. Perry, Florida's 85th Supreme Court Justice since statehood was granted in 1845, has announced his retirement in a letter to the Governor effective December 30, 2016. Read more. Court Launches Its Own Facebook Page. The Florida Supreme Court has added to its social media presence by creating a new page on Facebook. Read more. Chief Justice Announces Workgroup on Courthouse Security. Chief Justice Jorge Labarga is creating a new workgroup to study local courthouse security. Read more . Ninth Circuit Debuts Podcast Program. The Ninth Judicial Circuit has started a podcast program, and its first podcast features Chief Justice Jorge Labarga. Read more . Memorial Service Planned for Former Clerk of Court Sid J. White. Sid J. White died August 13, 2016, at his home in Monticello, Florida, and will be honored at a courtroom memorial service to be held later this summer. Read more . Labarga Presents Award for Excellence to Miami-Dade Judge. Miami-Dade Judge Stanford Blake received the award from Chief Justice Labarga during the annual education program for Florida’s 599 county judges. Read more. Labarga Presents Award for Excellence to Broward Judge. Broward Judge Robert Lee received the award from Chief Justice Labarga during the annual education program for Florida’s 322 county judges. Read more. Access Commission Issues Final Report. The Florida Commission on Access to Civil Justice has issued its Final Report recommending that it be made into a long-term Commission so it can continue its work. Read more. Justice Lewis Inducted into ROTC Hall of Fame. Justice R. Fred Lewis has been inducted into the ROTC Hall of Fame. Read more. Federal GAO Studies Florida Supreme Court Argument Broadcasts for Congressional Report. The federal Government Accountability Office released a report to Congress on May 31, 2016, about broadcasting appeals court arguments. It includes a detailed report on Florida Supreme Court broadcasts with an eye toward starting something similar at the U.S. Supreme Court. Read More . Supreme Court Commission on Access to Meet Friday. The Florida Commission on Access to Civil Justice created by Chief Justice Jorge Labarga will meet Friday, May 20, starting at 1:00 p.m. at the Jacksonville Marriott Hotel. Read more . Judicial Campaign Conduct Forums Scheduled May 12 and 13, 2016. All candidates for judgeships must comply with the requirements of Canon 7 of Florida’s Code of Judicial Conduct. There will be several 90-minute forums held throughout the state to assist with these requirements. Read More . Labarga Participates in White House Forum on Access to Justice. Florida Chief Justice Jorge Labarga will participate in a meeting on increasing access to justice April 19. Read More . Magna Carta Exhibit Opens at Florida Supreme Court. A traveling display honoring the 800-year history of the Magna Carta will be open to the public at the Supreme Court Building from February 15 to 26. Read more . Access to Civil Justice Commission Meets Friday. The Florida Access to Civil Justice Commission meets Friday in Tallahassee at the Hotel Duval. Read more . Labarga Chosen for a Second Term as Chief Justice. Jorge Labarga has been elected as the chief justice and administrative head of the Florida Judicial Branch for a new two-year term starting July 1, making him the first Florida chief justice to succeed himself in office since 1865. Read more . Florida Supreme Court Gives Input to Commission on Access to Justice. The Justices have sent a letter to Commission members advising them how to proceeding on several proposals including Web-based projects. Read more . Florida Court Public Information Officers Elect New Board. The Florida Court Public Information Officers, Inc., announce that they have elected their 2016-18 board of directors, which will oversee implementation of a new statewide court communications plan. Read more. 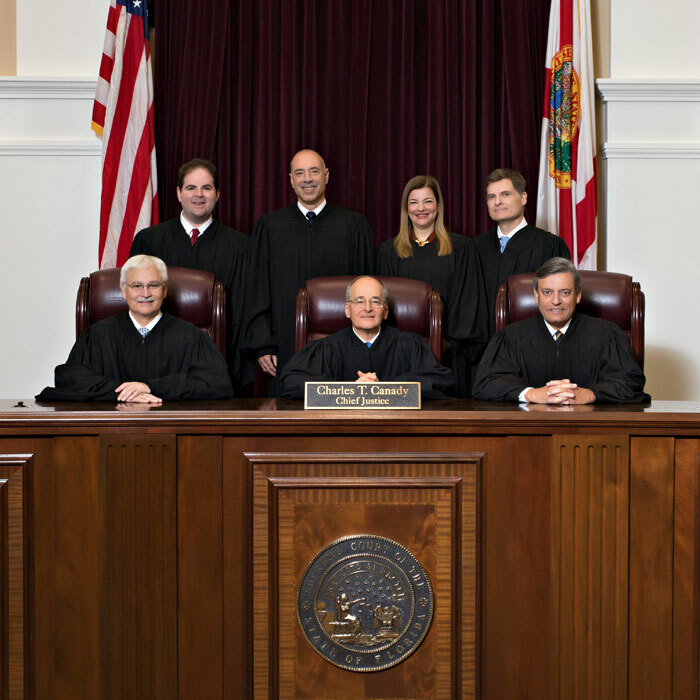 Florida Supreme Court Announces Long-Range Strategic Plan. The Court announced a statewide long-range strategic plan to guide planning for the state courts system through 2021. Read more. Florida Supreme Court Announces Statewide Communications Plan. The Court announced a statewide communications plan for the State Courts System that will be implemented starting in 2016. Read more . Memorial Events for the Late Justice Leander Shaw. The Florida Supreme Court has scheduled memorial events for Justice Shaw on December 21 and March 2. Read more . In Memoriam: Leander J. Shaw, Jr. The Florida Supreme Court mourns the passing of former Chief Justice Leander J. Shaw, Jr., who died in Tallahassee. Read more . Chief Justice Honors First Anniversary of Access Commission. Chief Justice Jorge Labarga issues a statement honoring the first anniversary of the Florida Commission on Access to Civil Justice. Read more . Miami Judge Steve Leifman Receives Rehnquist Award. Judge Steve Leifman of Miami-Dade County receives one of the nation's highest judicial honors for his groundbreaking work helping people with mental illnesses. Read more . Miami Judge Steve Leifman to Take Part in Washington Briefing on Mental Health. Since 1955 psychiatric hospital beds in the U.S. have dropped by 90 percent while the number people with mental illness in jails and prisons has risen 400 percent. Miami Judge Steven Leifman will take part in a Washington, D.C., briefing on this subject. Read more . Interim Report on Access to Civil Justice Released. The interim report of the Florida Commission on Access to Civil Justice has been released. Read more . Doctors Say Chief Justice Jorge Labarga Will Have a Speedy Recovery. Chief Justice Labarga underwent successful kidney cancer surgery Monday at Shands Hospital and is expected to recover quickly and fully. Read more . Supreme Court Commission on Access to Meet Friday. The Florida Commission on Access to Civil Justice created by Chief Justice Jorge Labarga will meet Friday, September 18, starting at 1:15 p.m. at the Tampa Airport Marriott. Read more . Chief Justice Jorge Labarga to Undergo Surgery. Chief Justice Labarga will undergo surgery this month to remove a kidney. Read more . Chief Justice Jorge Labarga expresses condolences at the death of Second District clerk. Chief Justice Labarga has issued a statement of condolences upon the death of Second District Court of Appeal Clerk Jim Birkhold in an auto accident. Read more . Miami Judge Steve Leifman Wins Rehnquist Award. One of the nation's highest awards for judges has gone to Judge Steve Leifman of Miami-Dade County for "his groundbreaking work helping people with mental illnesses." Read more . Sarasota-area Judge Lee Haworth Honored for Work Helping Homeowners & Children. Florida Chief Justice Jorge Labarga has given his judicial excellence award to Sarasota-area Judge Lee Haworth for years of work with homeowners caught in foreclosures and with children involved in the legal system. Read more . Miami Judge Steve Leifman Honored for Work on Mental Health. Florida Chief Justice Jorge Labarga has given his judicial excellence award to Miami-Dade Judge Steve Leifman for years of work on mental health issues in the courts. Read more . Second Access to Justice Meeting May 15. The second meeting of the Access to Civil Justice Commission will be May 15 in at the Tampa Airport Marriott Hotel. Read more . Proclamation on 25th Anniversary of ADA. Chief Justice Jorge Labarga signed a Proclamation designating July 2015 as a month to commemorate the passage of the historic disability rights law. Read more. First Access to Justice Meeting Jan. 16. The first meeting of the Access to Civil Justice Commission will be Jan. 16 in Tallahassee's Knott Building. Read more . State Courts Planning Meetings Announced. The Office of the State Courts Administrator will hold meetings around the state from now through March to receive input on the future of the Florida State Courts system. Read more. Labarga Orders Creation of Civil Justice Access Commission. Florida Supreme Court Chief Justice Jorge Labarga has signed the Administrative Order creating a state civil justice access commission on November 24, 2014. Read more. Labarga to Create Civil Justice Access Commission. Florida Supreme Court Chief Justice Jorge Labarga will announce the creation of a state civil justice access commission November 24, 2014. Read more. R. Fred Lewis Receives O'Connor Award. Florida Supreme Court Justice R. Fred Lewis received the Sandra Day O'Connor Award for his longstanding, internationally recognized work in law-related civic education. Read more. Judicial Campaign Ethics Forums. The Judicial Ethics Advisory Committee in cooperation with the Office of the State Courts Administrators offers forums May 8 & 9 to train judicial candidates about obeying election ethics rules. Read More . Pk Jameson Named Florida State Courts Administrator. Longtime government lawyer Pk Jameson has been named Florida's State Courts Administrator, assisting the Chief Justice in his role as administrative head of the Third Branch of Government. Read more . Florida Supreme Court Warns About Email Scam. The Florida Supreme Court has issued a warning about a worldwide email scam in which perpetrators pretend to send notices about Florida legal proceedings. Read more. Jorge Labarga Elected 56th Florida Chief Justice. Jorge Labarga was unanimously elected Chief Justice for a term starting July 1, 2014. He will be Florida's first Cuban-American Chief Justice. Read more. R. Fred Lewis Wins O'Connor Award. Florida Supreme Court Justice R. Fred Lewis has been awarded the Sandra Day O'Connor Award for his longstanding, internationally recognized work in law-related civic education. Read more. Former Justice Arthur J. England, Jr., 1932 - 2013. Chief Justice Ricky Polston issued a statement regarding the passing of former Justice Arthur England. Read more . Court Thanks Clerk Tom Hall with Proclamation. Florida Supreme Court Clerk Thomas D. Hall still has a few months to go before his retirement but the Court has already presented him with a token of its appreciation: a proclamation signed, sealed and delivered at the annual convention of The Florida Bar Convention. Read more. John A. Tomasino Named Supreme Court Clerk of Court. Mr. Tomasino, an attorney with technological expertise, brings strong credentials to his new position, which he will start on Nov. 1, 2013. Read more. Former Justice Ben F. Overton, 1926-2012. Justice Overton died of complications from heart surgery on December 29, 2012. Read more. Final Report of the Florida Innocence Commission. This Report and its Appendices are the result of two years of hearings on the subject of people wrongfully convicted of crimes in Florida. Read more . Judicial Campaign Ethics Forums. The Judicial Ethics Advisory Committee in cooperation with the Office of the State Courts Administrators offers forums April 26 & 27 to train judicial candidates about obeying election ethics rules. Read More . Ricky Polston Elected to Become Florida's 55th Chief Justice. The Justices have elected Polston to lead the state's Third Branch of government for a two-year term starting July 1, 2012. Read more. Florida Innocence Commission. The Florida Innocence Commission has released an interim report. Read more. FHP's Silvester Dawson Named Marshal. Florida Highway Patrol Lt. Col. Silvester Dawson has been appointed the Florida Supreme Court's new Marshal. He begins work June 1. Read more . 12th Annual Drug Court Graduation. Chief Justice Charles T. Canady will address Florida's 12th annual statewide drug court graduation ceremony on May 13. Read more . Garringer Appointed Executive Director of Innocence Commission. Chief Justice Charles T. Canady announced that former Monroe County Judge Lester Garringer has been named executive director of the Florida Innocence Commission. Read more . Proclamation on the 20th Anniversary of the ADA. Chief Justice Charles Canady issued a proclamation declaring July 2010 a month of commemoration celebrating the 20th anniversary of the enactment of the Americans with Disabilities Act. Read more . 11th Annual Drug Court Graduation. Chief Justice Peggy A. Quince will address Florida's 11th annual statewide drug court graduation ceremony on May 11, marking the 21st anniversary of the creation of the nation's first treatment-based drug court here in Florida. Read more . Judicial Campaign Ethics Forums. The Judicial Ethics Advisory Committee in cooperation with the Office of the State Courts Administrators offers forums May 6 & 7 to train judicial candidates about obeying election ethics rules. Read More . Charles T. Canady Elected to Become Florida's 54th Chief Justice. The Justices have unanimously elected Canady to lead the state's Third Branch of government for a two-year term starting July 1, 2010. Read more. Death of Former Justice Hopping. Chief Justice Peggy A. Quince issued a statement upon the Court learning of the death of former Justice Wade Hopping. Read more . 10th Annual Drug Court Graduation. Chief Justice Peggy A. Quince will address Florida's 10th annual statewide drug court graduation ceremony, marking the 20th anniversary of the creation of the nation's first drug court here in Florida. Read more . 30th Anniversary of Cameras in the Courts. Chief Justice Peggy A. Quince has proclaimed April 2009 as a month of commemoration honoring the 30th anniversary of Florida's broad rule allowing cameras into the courts. Read more. Report on Pro Bono Services by Florida Lawyers. This report details developments in the past few years affecting pro bono services -- free legal advice to the poor -- given by Florida lawyers. Read more. Justice Charles Wells Retires. Justice Charles T. Wells will retire March 3, 2009, when he reaches mandatory retirement age. Read more. Standard Civil Jury Instructions Placed On-Line. Florida's standard civil jury instructions now have been placed on-line on the Florida Supreme Court's website. Read more. Soto Named to Courts Advisory Council. Miami businessman Alex Soto was named to the state courts' chief advisory council by Chief Justice R. Fred Lewis. Read more. Justice Kenneth Bell Resigns. Citing family reasons, Florida Justice Kenneth B. Bell, 52, has resigned from the Florida Supreme Court effective October 1, 2008. Read more. Judicial Campaign Ethics Forums. The Judicial Ethics Advisory Commission in cooperation with the Office of the State Courts Administrators offers this forum to train judicial candidates about obeying election ethics rules. Read More . Justice Raoul Cantero Resigns. Citing family reasons, Florida Justice Raoul G. Cantero, III, age 47, has resigned from the Florida Supreme Court effective September 6, 2008. Read More. Peggy A. Quince Elected to Become Florida's 53rd Chief Justice. The Justices have unanimously elected Quince to serve as the first African American woman to lead the state's Third Branch of government. Read more. Florida Mental Health Summit. Governor Charlie Crist and other state leaders met with Chief Justice R. Fred Lewis for a statewide mental health summit at the Supreme Court Building on November 14 at 1:00 p.m., at which time a comprehensive Report was released on how the justice system can best deal with the mentally ill. Read more . Mental Health Summit. Chief Justice R. Fred Lewis will attend a national summit on the growing problem of jailing the mentally ill and will hold a statewide summit on the issue this fall. Read more . Mental Health & Law Initiative. The Chief Justice announced a new initiative in cooperation with the other branches of government to address the growing problem of the mentally ill and their interaction with the legal system. Read more . Judicial Campaign Conduct Forum. The Judicial Ethics Advisory Commission in cooperation with the Office of the State Courts Administrators offers this forum to train judicial candidates about obeying election ethics rules. Read more. R. Fred Lewis Elected to Become Florida's 52nd Chief Justice. The On March 15, 2006, the Justices unanimously elected R. Fred Lewis to become Florida's Chief Justice starting July 1. Read more. Video Developed to Help Inform Juveniles & Their Families. The Steering Committee on Families & Children in the Court has developed a video that can be shown the juvenile offenders and their families explaining the legal process they are facing. Read more. Court Posts Criminal Jury Instructions On-Line. The Florida Supreme Court's website now includes up-to-date criminal jury instructions. Read more . State Courts' Hurricane Preparation Pays Off. Four years of emergency preparedness planning paid off during the 2004 and 2005 hurricane seasons as state courts continued their essential functions even in devastated communities. Read more . State Courts Work to Improve Experience of Jurors. Chief Justice Barbara J. Pariente worked with Leon County and City of Tallahassee officials to make it easier for people to serve as jurors, a project that could be duplicated elsewhere. Read more . Long-Time Supreme Court Marshal Retires. Wilson Barnes, the Court's marshal for 15 years, was well known for his booming rendition of the traditional "Oyez!" in Court. Read more . Law Month Programs Announced. This year's law month activities honor the role of the jury in American law and were recognized in Florida by a Proclamation by Chief Justice Barbara J. Pariente. Read more .